Snyder’s Chocolate covered Pretzel Dips — Buy 1 get 2 free! 3 lb bags of Yellow Onions buy one get one FREE! Glazier’s website is pretty extensive and has a great printable grocery list. 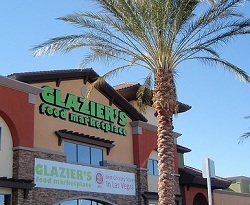 Click to see Glazier’s of Vegas Store list. TLC Extreme Couponing All Stars was filmed at Glazier’s! See my shopping trip at Glaziers in Vegas on TLC Extreme Couponing All Stars!